The earlier indicators we’ve had of lively growth in international enrolment in Australia are being reinforced by the latest data from the Department of Education and Training (DET). The most recent DET data release, for year-to-date April 2017, indicates a 14% increase in student numbers compared to the same period in 2016. 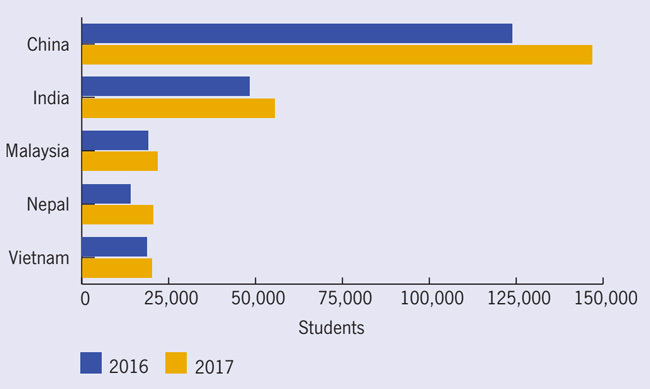 This translates to a reported enrolment base of 492,964 foreign students in the country as of April 2017, with each of the top five source markets – China, India, Malaysia, Nepal, and Vietnam – contributing to that continuing growth this year. In combination, those top-five markets represent more than half (53%) of all international enrolment in Australia. While YTD April is only the first third of the year, the indication in the data we are seeing so far for 2017 is that international enrolment growth in Australia is indeed accelerating. This is relative to 11% year-over-year growth between 2015 and 2016, and an average annual growth rate of roughly 6.5% for the previous decade. As we noted earlier, there was a marked increase in student visa volumes in Australia in the first three months of this year, and that significant increase in visa files now seems to be translating to a corresponding bump in student arrivals. 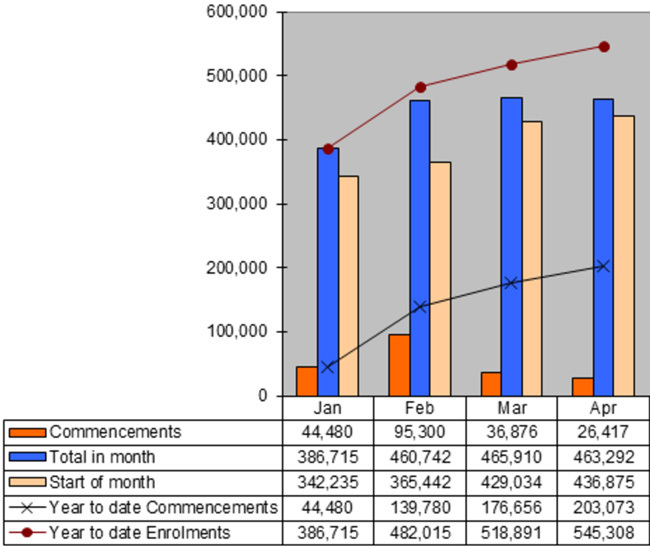 Year-over-year growth in commencements has ticked sharply upward this year with 12% more students beginning their studies between January and April than during the same period in 2016. This compares to YTD growth of 9% and 7% respectively over the previous three years, and needless to say that influx of new students is helping to push overall enrolment levels to new record highs in 2017. There are some interesting differences in the mix of top markets when we look just at commencements (as opposed to total enrolment). 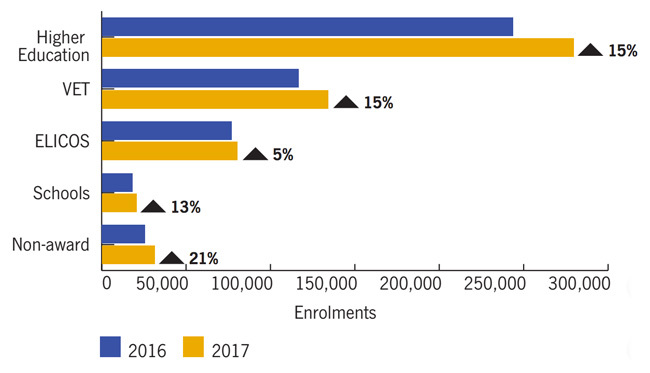 Brazil, for example, is the eighth-largest source market in terms of overall enrolments, but, thanks to notable growth YTD April 2017, jumps up to the third-largest sender of new students, after only China and India. Brazilian commencements are up 16% in the first four months of 2017 (compared to the same period from a year before), and that has helped to grow total Brazilian enrolment in Australia by 22% compared to 2016. Another Latin market, Colombia, is safely outside of the top ten senders in terms of total enrolment. But it too makes an appearance in the top ten table for commencements, with 22% growth in new student arrivals YTD April and a corresponding 27% increase in overall enrolment so far this year. Other notable growth markets to this point in the year include Nepal (the number five market by overall enrolment), Sri Lanka, and Kenya – each of which is up by 30% or more compared to 2016. Higher education registered the greatest growth in commencements during the first four months of 2017, up 16% over the year before. However, as the chart above will suggest most other sectors were close behind with vocational education and training as well as schools each growing 12% and non-award studies by 11%. Hot on the heels of this latest trend data, Australia’s Minister for Education and Training Simon Birmingham recently announced an additional AUS$3.6 million (US$2.8 million) in funding to support early stage implementation of Australia’s National Strategy for International Education 2025. Australia’s national strategy is a comprehensive ten-year blueprint for the expansion of the country’s international education sector. Among other key goals, the strategy aims to expand onshore foreign enrolment to 720,000 students by 2025. This entry was posted in Australia, Australia/Oceania, Most Popular, Regions and tagged Most Popular, ELICOS enrolment, higher education statistics, universities with international students, postgraduate student recruitment.